with General Atomic's Thomas Cassidy to his right. The continuing rise of Predator drones at home has been fueled by the bizarre merger of military influence in domestic affairs and the key role of border hawks in the politics of immigration reform. DHS's early decision to tap generals involved in the military's own controversial overseas drone program to shape and direct the domestic drone program points to the increasing merger of the post-9/11 homeland security/border security complex with the military-industrial complex. Drone proliferation at home will likely increase from a multibillion-dollar spending surge to boost "border security" as a result of congressional proposals to reform immigration policy. At home and abroad, drone proliferation has benefited from a broad bipartisan consensus about the purported success of the US military's foreign deployment of Predator drones in counterterrorism operations by the Pentagon and intelligence apparatus. Drone proliferation at home is closely linked to military and CIA enthusiasm for what are formally called unmanned aerial vehicles (UAVs), or simply unmanned systems. DHS decided - with virtually no reviews or evaluations - to purchase unarmed versions of the Predator drones used abroad for "signature strikes" (targeted drone killing). The department, whose mission includes "border security," has also relied on military bases along the land border and coastal waters to host its own drone fleet. Since DHS began acquiring Predators, along with Predator variants called Guardians, from General Atomics nine years ago, this domestic drone program has proved an abysmal failure - whether measured by its effectiveness in immigration enforcement, drug control, or counterterrorism. A series of reports by the General Accountability Office, Congressional Review Service, and the DHS Inspector General’s Office have documented the paltry achievements, the alarming strategic confusion, and near-systemic logistical and technical shortcomings of the DHS drone program. Yet these official reviews failed to shed any light on the department’s controversial decision to deploy only the hugely expensive military-grade Predator drones and to enter into sole-source contracts with General Atomics to provide, maintain, and even operate the federal government's domestic drone fleet. The continuing rise of Predator drones at home has been fueled by the bizarre merger of military influence in domestic affairs and by the key role of border hawks in the politics of immigration reform. The decision early on by DHS to tap generals involved in the military's own controversial overseas drone program to shape and direct the domestic drone program points to the increasing merger of the post-9/11 homeland security/border security complex with the military-industrial complex. Drones in Immigration Reform's Proposed "Border Surge"
Prominent immigration reform advocates such as Sen. Charles Schumer (D-NY) and Cong. Henry Cuellar (D-Texas) insist that "continuous" and "24 hours, seven days a week" drone surveillance is a fundamental condition of successful immigration reform. Yet these and other border drone advocates don't point to the achievements of the current DHS program. Rather, like Cuellar, they point to the purported success of the US military's antiterrorist drone program. "We gotta have efficiencies, effectiveness, accountability on how they're used," he said. "But again, keep in mind, look at the history how they've been used extremely well in the military," said Cuellar, who cochairs the Congressional Caucus on Unmanned Systems, commonly known as the "Drone Caucus." Prior to 9/11 and DHS's creation, the Border Patrol and the US Customs Service (the legacy agency that became ICE), the various Border Patrol and US Customs sector offices mainly tapped their planes and boats to do what these agencies have traditionally done, namely apprehended unauthorized immigrants and seize illegal drugs. Under OAM, the actual operations remain largely the same, although now framed in a new security, counterterrorism context. According to CBP, the mission of OAM is "to detect, interdict, and prevent acts of terrorism and the unlawful movement of people, illegal drugs and other contraband towards or across the borders of the United States." OAM boasts that it "is the most experienced operator of Unmanned Aircraft Systems in the Homeland Security mission set on the world stage." OAM currently has a fleet of 10 Predator and Guardian drones manufactured by General Atomics. The OAM strategic plan calls for a fleet of two dozen drones by 2015 - a goal that seemed unlikely to be reached given budget-cutting and the abysmal performance record of the OAM drones. The first and signature initiative of the newly created OAM was to enter into a collaborative venture with General Atomics for unmanned Predator drones for border security operations - the first of which was deployed from Ft. Huachuca Army Base in Sierra Vista, Arizona shortly after the founding of OAM. In April 2006, this first CBP Predator crashed and was totaled in the Arizona desert due to a control error by the remote piloting team contracted from General Atomics. 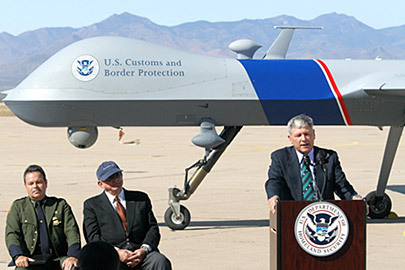 Since 2005, when CBP deployed its first major drone, the UAV program of DHS has been the subject of mounting concern and criticisms from the government's own oversight and research agencies, including the Congressional Research Service, the Governmental Accountability Office, and the DHS's own Office of Inspector General. In November 2012, CBP did sign a sole-source contract with General Atomics Aeronautical Systems to provide maintenance and operating crews for its current contingent of UAVs and to purchase as many as 14 additional drones. But there was little hope that the money could be found until drones became a core component to the "border surge" advocated by Sen. Schumer earlier this year. CBP insists that there is only one "responsible source" for its drone needs and that no other suppliers or servicers can satisfy agency requirements for these $18 million drones. In a November 1 statement titled "Justification for Other than Full and Open Competition," DHS contends that General Atomics Aeronautical Systems Inc.'s (GA-ASI) knowledge of the production, operation, and maintenance of the MQ-9 [Predator] is so unique that a transition of OAM UAS equipment to a UAS other than the MQ-9 or support services to a company other than GA-ASI would notably impact the CBP UAS program," including "appreciably impacting national security through decreased interdictions of contraband (e.g., illegal narcotics, undocumented immigrants)."